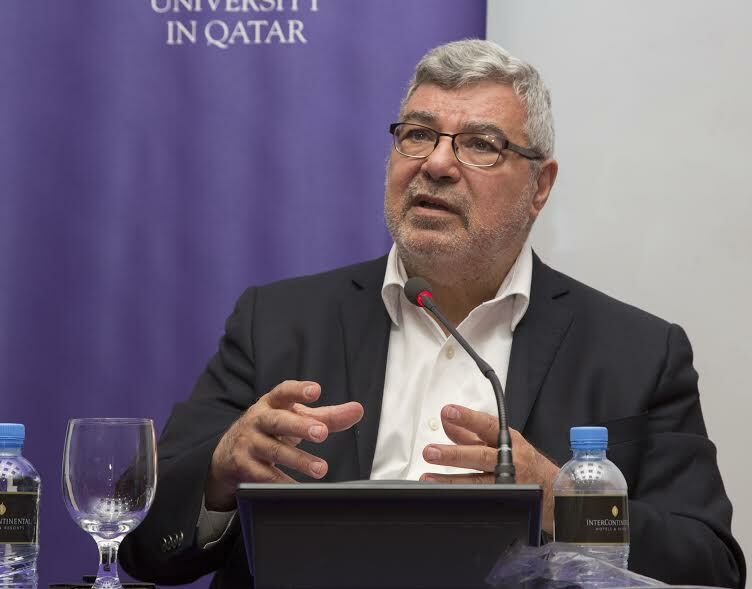 Doha, Qatar: Respected political analyst and internationally syndicated journalist, Rami Khouri, who is also a member of Northwestern University in Qatar’s advisory board, visited NU-Q and held several forums with students, faculty, and staff. “As one the leading voices interpreting the Middle East to the West and the West to the Middle East, Mr. Khouri’s visits to NU-Q provide students and faculty with a unique opportunity to engage in discussions concerning the region with one of the leading voices in journalism in the Middle East. His understanding and breadth of knowledge on the world’s most discussed issues, Syria and the rise of ISIS, helps our faculty and students to develop a clearer understanding of the complexity surrounding such tragedies,” said Everette E. Dennis, dean and CEO. In two lively sessions at NU-Q, students, staff, and faculty gathered to listen and discuss Khouri’s findings and evaluation of the region’s most prominent issues. The first session, which discussed Syria’s traumatic civil and international war, saw Khouri breakdown the events into differently weighted conflicts and battles. “It is the greatest proxy war in the Middle East,” said Khouri, “Syria’s situation clarifies most of the conflicts in the region, as well as modern ways of political engagement and manifestation.” He added that the war will not be resolved unless one side wins, or the country suffers massive fatigue, that in turn leaves people with no option but to settle for a short-term solution. In his talk, Khouri also addressed NU-Q’s biggest challenge as a journalism school, which he said is to teach students how to approach such politically and socially convoluted issues, by teaching them how to accurately analyze and understand them. “Two important components of good journalism are research and analysis. Equipping students with the know-hows of gathering valid information will help them to make the best judgement when reporting on politics and public policy,” he said. In an open-floor discussion, moderated by NU-Q’s Zachary Wright, associate professor in residence in the liberal arts program, students and faculty raised questions on Syria and the importance of media in reporting on such events. In a second discussion, moderated by NU-Q’s Khaled AL-Hroub, professor in residence in the liberal arts program, Khouri discussed how issues in the region created chaos and instability, allowing groups like ISIS to flourish. “The continuous foreign military presence in the region since the 1980s, along with the radicalization of prisoners in Arab jails led to the formation of these movements. To understand what ISIS means and where they come from, we need to look at the trajectory of how it grew, and the role of unaddressed socio-political issues, such as failed economies and illegitimate governance in giving them reasons to exist,” he said. Khouri also emphasized the need to resolve deeply-rooted problems in the region – including democracy, education, labor issues, national identity, and others – which, he said, have been disregarded by leaders and global powers, despite their importance in eradicating terrorist groups and bringing back peace and stability to the region. Khouri is the former director, and now senior fellow of the Issam Fares Institute for Public Policy and International Affairs at the American University of Beirut. He also currently sits as a senior fellow, Middle East Initiative, in the John F. Kennedy School of Government at Harvard University. Previously, he was editor of The Daily Star newspaper in Lebanon, and editor-in-chief of The Jordan Times. Khouri has written for many leading international publications, including the Financial Times,The Boston Globe, and The Washington Post. Northwestern University in Qatar draws from its parent organization, Northwestern University (Evanston, Illinois), a distinguished history, famous programs and an exceptional faculty. Founded in partnership with Qatar Foundation, NU-Q provides a framework through which students explore the world and, ultimately, shape its future through its distinguished schools of communication, journalism, and liberal arts.